Swiss Ski Club of New York - Zermatt - A week with the SSC in Switzerland! Zermatt - A week with the SSC in Switzerland! Ski Switzerland with the SSC! RESERVE NOW for $200 super early-bird discount!! Zermatt Hotel Ambassador is 4-STAR. Close to ski lifts. The Matterhorn - one of the world’s most photographed mountains towers over Zermatt. Ski in 4 areas: Sunnegga, Gornergrat, Klein Matterhorn and Schwarzsee; 224 miles of pistes. Or ski to Cervinia in Italy via the Plateau Rosa glacier for lunch & shopping (add’l lift ticket). The Gornergrat, Europe’s highest cog railway, brings passengers over dramatic bridges and tunnels to the summit. Enjoy Panoramic views of Switzerland’s highest peaks. Ski Klein Matterhorn where you can look the Matterhorn right in the eye. Savor fantastic lunches at cozy mountain restaurants surrounded by spectacular scenery. Zermatt’s runs are carefully groomed for every skill level. 60% of runs are red (intermediate); 20% of runs are expert (black). Longest run is 15 miles. Cervinia, Italy is an intermediate skier’s paradise with wide and deserted pistes. Expert skiers can enjoy ski touring and heli-skiing over untouched snow. Non-skier or want to take a day off? – Enjoy the ice rink or a sunny terrace. 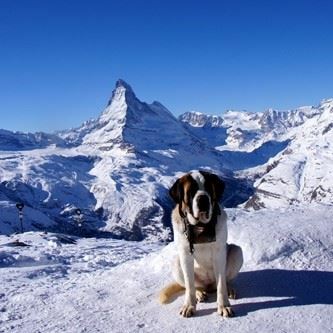 Go snowshoeing or sledding at the Gornergrat and take in the beautiful views of the Matterhorn. 4-Star modern hotel. All rooms have balconies with mountain views. Located in the center of Zermatt; next to the Gornergrat train station. Other lifts are easily accessible within walking distance or via shuttle bus next to the hotel. Hotel Amenities: large indoor pool, whirlpool, sauna, hotel bar, ski storage, ski shop/rental. Double-occupancy rooms. Single occupancy add $500. Includes 4-course gourmet dinner every night. Luggage delivered from the transfer bus to the hotel. FLIGHT DETAILS and LAND PACKAGE OPTION: See flyer. For full pricing schedule and options, see Flyer. Cancellation policy: Prior to 10/22/17: $150; between 10/22/17 and 11/22/17:-$800; between 11/23/17 and 12/10/17: 75% of trip price; after 12/10/17: 100% of trip price. Trip insurance is highly recommended The price of insurance is 6% of the trip cost. For more information or to book trip insurance, email Trip2018@swissskiclub.org at the time of booking with the subject line “Trip Insurance.” Separate payment by check is required and is due within 10 days of booking. Copy of passport needs to be submitted to book flight. Passport needs at least two blank pages and must be valid for at least 6 months beyond conclusion of the trip. For important additional details, see our printable Zermatt flyer.